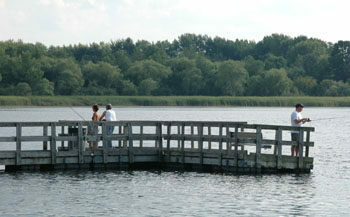 Purchased by Oakland County Parks in 1980, the main feature of Orion Oaks is Lake Sixteen, a 90-acre lake without a single house or condo on it in a corner of the state where everybody wants to live on the water. But the rest of the 927 acres is a mix of meadows and woods, ridges, hills and hollows. It's the rolling contour of the land, not the undeveloped lake, that makes Orion Oaks such an interesting place to hike, mountain bike or Nordic ski. 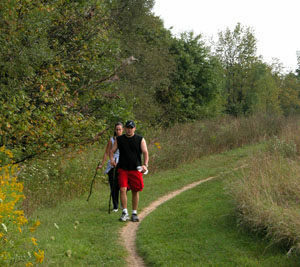 The park's trail system was totally revamped in 1997 and then re-designated in 2009. Once a mishmash of old roads and two-tracks, the 10-mile system is now well posted and easy to follow, featuring a system of numbered junctions with locator maps benches, and boardwalks through wetlands. 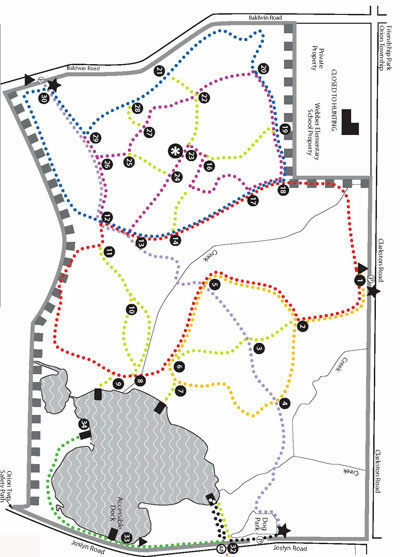 The park has three trailheads with parking, map boxes and vault toilets and in 2009 the trail system was re-organized into six highlighted routes and a handful of connector trails. Departing from the Clarkston Road trailhead is the Bluebird Loop, the longest route at 3.1 miles, and the 1.77-mile Massasauga Loop. Departing from the Baldwin Road trailhead is the 2.62-mile Dragon Loop, departing from the Joslyn Road trailhead is the 0.94-mile Dog Tail Trail while connecting the two parking areas is the Orion Thru-way, a point-to-point hike of 1.83 miles. In the center of the park, not connected to any trailhead, is the Fossil Hill Loop, a 1.95-mile route that includes climbing up to the park’s high point at 1,100 feet for a view of the surrounding area. 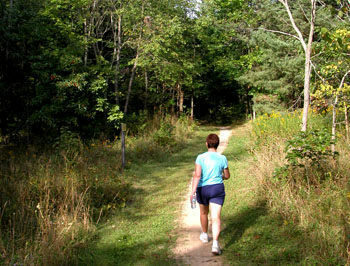 For many trail users Orion Oaks is not so much a designated route but a desire to be outdoors in a scenic setting, which might include the park’s high point, reaching the walk-in fishing docks on the west side of Lake Sixteen or viewing the tall pines between post No. 11 and No. 12. For this reason the Orion Oaks Perimeter Loop has been included. The route, parts of several loops, is an 2 to 4-hour walk for most people and includes all three. In the winter Nordic skiers and snowshoers use the ungroomed trails, the rest of the year hikers and mountain bikers share them. The trails make for an interesting walk any time of the year but in November and December, after the leaves have fallen but before heavy snow arrives, the view from a scenic overlook on the park’s main ridge is especially nice. Orion Oaks Bark Park (www.destinationoakland.com) opened in 2000 to the delight of dog owners everywhere. It’s now the most popular section of the park. The 14-acre, fenced-in area is one of the largest in Michigan and features two main trails, a field training area, benches, restrooms for people, “poop bags” for their pets. But its most unusual feature is a dog-only swimming area on Lake Sixteen. The park is open year-round from a half hour before sunrise to half hour after sunset. A motor vehicle daily permit or an annual Oakland County Parks pass is required to enter the park by both county residents and non-residents.